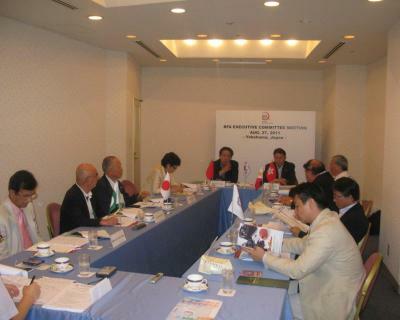 2nd Executive Committee Meeting in 2011 of the Baseball Federation of Asia (BFA) was held in Yokohama on August 27, 2011.ã€€Olympic Reinstatement of baseball and the calendar of BFA’s continental championship were among key themes. The meeting was presided by BFA President Seung Kyoo Kang (Korea) and was attended by representatives from China, Chinese Taipei, Hong Kong, Korea, Pakistan, Philippines and Japan, the host. After the meeting, the members attended Opening Ceremony and reception of the 9th 18U Asian Baseball Championship. The EC members gathered again for breakfast on the following day, the first day of the Championship, welcomed the representatives from Malaysia and Singapore who were special guests of Baseball Federation of Japan and recognized their efforts to develop baseball in the region.